The idea is that an artist or record label applies to the PPL and is given a series of codes – free of charge, I understand. These take the form of a 12-character alphanumeric string, such as GBXXX0600123 – where.. So the label/artist allocates a unique code from their series to each track on any album it releases (including a different code for different versions, eg. remixes or edits, of the same track). 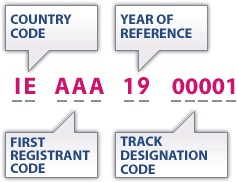 If the label then licenses the same track to different companies in different countries, the ISRC code still remains the same and is always tied to that track. If the track turns up on some strange album without its ISRC code, or with a false code, then it’s a good indication that piracy may have taken place.